On 13th June 2006, Johnny Hooper launched his new restaurant in Albufeira. "Johnny Hooper's Saxophone Bistro" opened to a packed house and Johnny's first performance in his own place went down a storm. Everyone raved about the food and the atmosphere. There was also a guest spot by the lovely singer 'Chantilly' from The Midlands, UK who performed a couple of numbers to rapturous applause. The Saxophone Bistro had been carefully refurbished to create the ambience and relaxed buzzy atmosphere which is well associated with Johnny's shows. The food served is International cuisine and of the freshest quality with the menu changing frequently according to seasonal produce and availability. Tantalising fresh homemade desserts are also on the menu. There was a surprise on the opening night, when Mike Doyle, the well-known Welsh comedian and singer popped in after spending all evening tracking Johnny down! They hadn't seen each other for 10 years. When Mike got up on stage to sing a wonderful version of 'Breaking Up Is Hard To Do' the audience went wild. 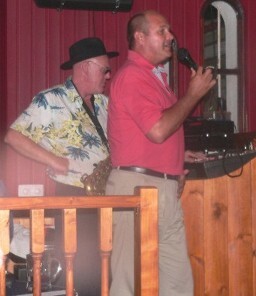 Johnny Hooper will be performing at The Saxophone Bistro on Tuesday and Friday nights throughout the season. After many years of playing at The Cave, it is an end of an era, but also the beginning of a new exciting one to come!